The aim of this research was to carry out a quantitative and comparative Life Cycle Assessment (LCA) as outlined in ISO Standard 14044:2006, on natural fibres vs glass fibres for use as the reinforcements in polymer matrix composites in order to establish the most sustainable option. Eight environmental impact classification factors (EICF), i.e. global warming, acidification, eutrophication, human toxicity, aquatic toxicity, ozone depletion, photochemical oxidants creation and non-renewable/abiotic resource depletion were identified as appropriate parameters for the analysis. 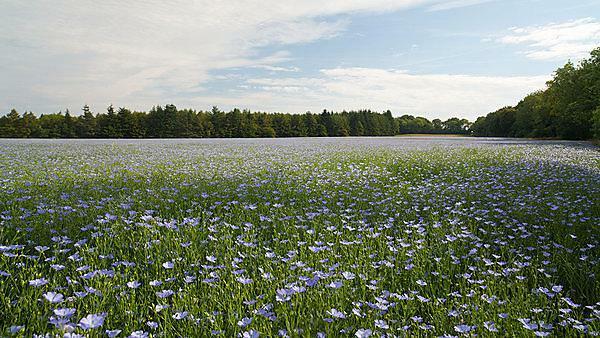 Flax, currently grown commercially in Europe and the most resource intensive of the common bast fibres, was selected as the candidate fibre for this study. The results of the study should help to confirm or refute the proposition that natural fibres are the more suitable option for a sustainable society. The scope of the study is cradle-to-gate: (a) for natural fibre: to quantify the energy inputs and other EICF at every stage in flax cultivation from preparing the land through the use of agro-chemicals to harvest and then fibre processing; (b) for glass fibre: to quantify the energy inputs at every stage of fibre production from raw material extraction, crushing, melting, refining, forming, spinning and curing into a comparable reinforcement form for composites. A data set was compiled from numerous literature sources to complete the Life Cycle Inventory for the production of flax fibres. Three scenarios were studied for the production of either flax sliver (pre-spun fibre) or yarn (post-spun fibre): low (no-till combined with warm water retting), average (conservation tillage with stand/dew retting) and high (conventional tillage with bio-retting) energy routes considering different agricultural and fibre preparation (retting) methods. The analysis for natural fibres assumes that flax plants are grown until mid-point flowering then dessicated with glyphosate to reduce energy use at the decortication stage. As no seed is produced, the fibre is the only high value product. Further, the by-/co-products (short fibre for paper or animal bedding and dust for fuel briquettes) are not apportioned any of the environmental burdens from the growth of the plant, but are discounted post-separation as they become products in their own right. The raw data is thus amenable to reinterpretation where the burdens are allocated on the basis of mass or economic value. The best agricultural practice for the flax fibre production was identified as the no-till method combined with warm water retting. The environmental credentials for flax fibre can be further improved by using organic fertilisers and biological control of pests. Spinning is the most energy intensive fibre processing operation hence by eliminating this operation, energy use and the associated environmental impacts could be reduced. Based on the energy analysis, continuous glass fibre reinforcement appears to be superior to spun flax yarn but glass fibre mat and flax sliver are equivalent and embody similar quantities of energy per tonne. The environmental benefit arising from substitution of glass fibres by natural fibre is dependent on the chosen reinforcement format. The key consideration is to use sliver (pre-spun fibres) as reinforcement in polymer matrix composites instead of yarn. The e-thesis (4.227 MB PDF) is now available from the Plymouth Electronic Archive and Research Library (PEARL). If you have an interest in this topic, then please contact John Summerscales. NPJ Dissanayake and J Summerscales, Life Cycle Assessment for natural fibre composites, Chapter for Vijay Kumar Thakur (editor): Green Composites from Natural Resources, Taylor & Francis Group LLC, USA, submitted 27 November 2012. ISBN 978-1-4665-7069-6. Composites Part A: Applied Science and Manufacturing, October 2010, 41(10), 1329-1335. Composites Part A: Applied Science and Manufacturing, October 2010, 41(10), 1336-1344. Journal of Natural Fibers, October 2009, 6(4), 331-346. Journal of Biobased Materials and Bioenergy, September 2009, 3(3), 245-248. ROME – Italy, 15-18 April 2009 (refereed in JBMBE, 2009). Abstract #10, pages 47-58. ISBN-13: 978-0-9809664-0-4. CORRECTION: This paper did not recognise the full implications of mass loss during the process and hence reports lower embodied energies than the corrected data reported in the JNF paper. MONTRÉAL (Québec) – Canada, 8-10 July 2008. CD-ROM/pdf/z_poster/19.pdf. Book of abstracts page 124. BARCELONA – Spain, 4-5 October 2007.